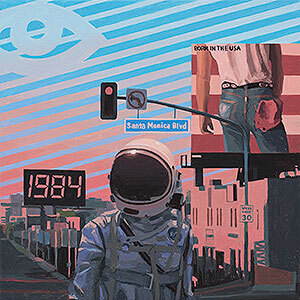 On view in the Thinkspace project room are new works by painter Scott Listfield in 1984. His hyper-realistic oil paintings depict sprawling, sparsely occupied and seemingly unpopulated landscapes, cast with the unease of an ambiguous end of days. A single astronaut appears prominently throughout Listfield’s works, wandering this timeless fugue terrain that feels at once familiar and distant, dreamy and ill-defined, strange, even, in its displaced familiarity. The artist’s works draw from a ScFi inflected imaginary in which nostalgic references to pop culture and quasi-apocalyptic cynicism playfully, if not ominously, collude. For his new body of work, 1984, Listfield, as the title suggests, invokes the dystopian futurity of Orwell’s 1949 classic, a text which has experienced a recent surge in Amazon sales, perhaps an indication of some collective, self-reflexive admission. This incidental fact piqued the artist’s interest in the current timeliness of the Orwellian nightmare; a vision of surveilled humanity seems somehow less outlandish and far-fetched in our era of simulated falsification and mediated experience. Our culturally dictated über reliance on social media, handheld devices, and virtual platforms, all in service of some feigned human connectivity, are forged through a bizarre consensual voyeurism – not such a far cry from Big Brother’s omniscience after all. These new works include bright saturated visions inspired by a stylized 1980s Los Angeles, hedged by a requisite amount of Listfield’s dystopian edge and barbed wire. The artist’s own 1980s childhood memories inform the paintings, as does the culturally produced aesthetic nostalgia for the decade, evidenced in recent television shows and style trends. Producing a pastiche of time and place, Listfield taps into the misleading anachronisms of memory, and nostalgia’s power of stylization, not to mention the strange ways in which our versions of the past may in fact tell us more about our conditions in the present.